Beverly Hills, California – (November 7, 2015) – BREAKING NEWS: Julien’s Auctions, the world’s premier entertainment and music memorabilia auction house, sold what many have called the most important Beatle guitar to ever hit the auction block for a record $2,410,000 price today. The John Lennon original 1962 J-160E Gibson Acoustic guitar had been lost for over 50 years and represented a rare and significant guitar to John Lennon’s history. It’s September of 1962 and The Beatles’ John Lennon and George Harrison each purchase jumbo J-160E Gibson acoustic guitars from Rushworth’s Music House in Liverpool for £161. Never would one imagine that the guitars would become so significantly important to the history of the Beatles nor engage such an undeniably intriguing story of its future whereabouts. When purchased by two of the members of the Fab Four the guitars were the only ones of their type in the country which were said to have been flown to England by jet from America after being specially ordered. The two guitars were identical apart from the serial numbers. The Beatles traveled from Liverpool to London’s EMI Studios on September 11, 1962, the day after receiving the guitars. The first song recorded that day was “P.S. I Love You,” followed by “Love Me Do.” It was Lennon who used this guitar on many of the recordings they did in 1962 and 1963 that required an acoustic guitar. 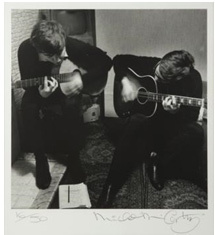 John so loved this particular guitar that he would take it home and wrote songs on it with Paul McCartney. Beatles hits like “She Loves You,” “I Want to Hold Your Hand,” “Please, Please, Me,” “All My Loving,” “From Me to You,” “This Boy” and more were written with this guitar. Historians and Beatles fans can also find this particular guitar on the UK singles “Please Please Me/Ask Me Why” and “From Me to You/Thank You Girl.” The photograph (seen left) which shows John Lennon playing the guitar had sold for $6,875 separately. No other guitar ever offered at auction can compare to the history this guitar has with The Beatles’ John Lennon. It also appeared on Please Please Me (album UK), Introducing The Beatles (album US VJ), The Early Beatles (album US Capitol), With The Beatles (album UK), Meet The Beatles (album US Capitol), The Beatles One (Album), The Beatles Anthology 1, Live At the BBC (The Beatles Album) and much more. In addition the guitar was used on the UK EPs such as The Beatles (No.1), The Beatles’ Hits, Twist and Shout and more. It can be seen in the November 22, 1963 videos of I Want to Hold Your Hand and This Boy. In December1963, during The Beatles Finsbury Park Christmas Show, John’s guitar went missing and he later replaced it with a 1964 model. Other outstanding results at today’s Icons and Idols: Rock n’ Roll auction at Julien’s Auctions include Elvis Presley’s 24K Gold Leaf Piano which sold for another record price of $600,000. The piano, the most important piano to be offered from Elvis Presley’s history, was played by Elvis Presley while in the music room at Graceland in Memphis, Tennessee. The piano’s original finish was walnut and was once housed in the Dixon Myers Auditorium, now the Cook Convention center in Memphis. Presley purchased the piano for his mother in 1955 when the city sold it and moved it to his new home on Audobon Street when it would not fit into their apartment. The piano was later delivered to Graceland and kept in the music room. 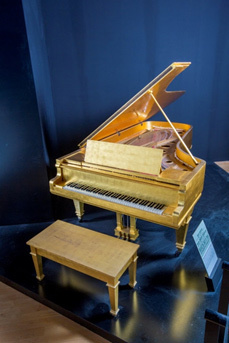 Priscilla Presley decided to adorn the piano in 24K gold-leaf finish as a gift for the couple’s first wedding anniversary. 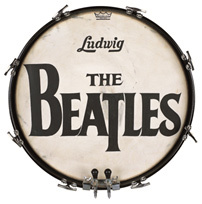 The most famous of the seven known Beatles drop-T logo drum heads — The Ed Sullivan drum head — was also auctioned today at Julien’s Auctions, bringing in a final price of $2,125,000.00. Aside from its status as the most celebrated of the seven drop-T logo drum skins, the Ed Sullivan Show head (also known as drum head #2) is the only one that was featured on a Beatles album jacket. It appeared on the covers of the Capitol LPS The Beatles Second Album and Something New as well as on the interior gatefolds of Capitol’s The Beatles Story and Parlophone’s Beatles for Sale. With expertise specializing in entertainment memorabilia, Julien’s Auctions has quickly established itself as the premier auction house in high profile celebrity sports and entertainment auctions. Julien’s Auctions presents exciting, professionally managed and extremely successful auctions with full color high quality auction catalogs unlike any other auction company. 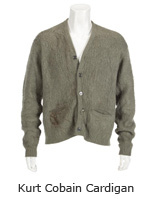 Previous auctions include the collections of Cher, Michael Jackson, U2, Barbara Streisand, the estate of Marilyn Monroe, Bob Hope, Les Paul and many more. Official website is www.juliensauctions.com. For hi res images at 300 dpi (and above), please email requests to: info@juliensauctions.com.